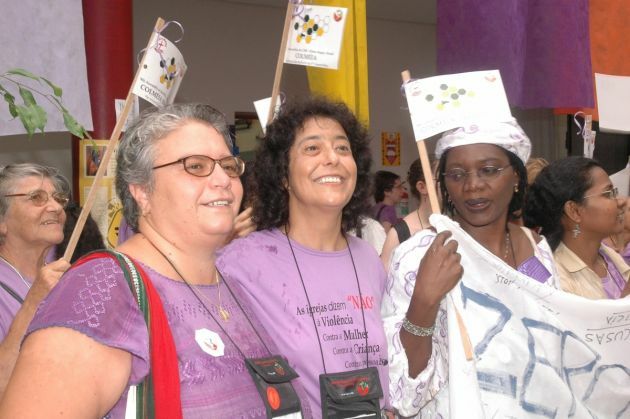 (Photo: WCC / Igor Sperotto)The March to end Violence Against Women and Children during the 9th WCC Assembly in Porto Alegre, Brazil on February 16, 2006. A global coalition of faith-based organizations working together to address unprecedented levels of violence against women and girls. "From Peace in the Home to Peace in the World: Make Education Safe for All," is the theme for this year's focus, the World Council of Churches said in a statement. The period begins Nov. 25 with the United Nations International Day for the Elimination of Violence against Women and continues until Dec. 10, Human Rights Day. The coalition includes the Anglican Communion, Islamic Relief, Mission 21, Lutheran World Federation, World Council of Churches, World Communion of Reformed Churches, World YWCA, Church of Sweden and Finn Church Aid. Rev. Elaine Neuenfeldt, LWF Secretary for Women in Church and Society, said this year's theme allows churches to openly and directly discuss the problem of early and forced marriage. The aim of the campaign is to encourage faith organizations and congregations building awareness of the sad reality that so many girls face. By engaging faith leaders and advocates at different levels, it is hoped they will address the topic in sermons, conversations, group work and women's fellowship. "We want to bring this to a public level. It should be part of an agenda that addresses the public role of faith organizations. "Girls should be able to flourish, as human beings, not as child brides, not as commodities to be negotiated," said Neuenfeldt. She noted, "We want to see girls with dignity, with access to education, with the ability to make choices, to decide their future. This is our dream – a world without violence and discrimination." The campaign is reiterating the importance of an inter-religious approach to the 16 Days of Activism to end gender-based violence observed each year throughout the world. "From Peace in the Home to Peace in the World: Make Education Safe for All," is the theme for this year's focus. The period begins Nov. 25 with the United Nations International Day for the Elimination of Violence against Women and continues until 10 December, Human Rights Day. UN Women says one third of women globally have experienced physical or sexual violence at some point in their lives. More than 125 million girls and women alive today have been subjected to female genital mutilation across countries in Africa and the Middle East. The campaign hones in on the connection between children, early and forced marriage and lack of access to education. It calls for schools to be held as protected spaces, for greater gender justice awareness among girls and their families, for rites of passage and other gender and sexual socialization processes within cultures and religions to be recognized. It also presses for sexual and reproductive health and rights for girls to be viewed as crucial in efforts to overcome violence against women and promote women's empowerment. - share the importance of working with faith leaders and encourage them to pledge to never sanctify any union that involves a minor. The coalition plans to collaborate closely with U.N. agencies and diplomatic missions. In particular it will cooperate with those working to overcome early and forced marriage and ensure access to education, to strengthen local communities' ability to reject the practice of early marriage. The emphasis will be in countries where the incidence of early marriage is high, by mobilizing faith constituencies. The campaign is linked to U.N. human rights treaty bodies and mechanisms, such as the Convention on the Elimination of All Forms of Discrimination against Women, the Universal Periodic Review of human rights, and Security Council resolution 1325 that affirms the role of women in preventing and resolving conflicts.